and freethinker Denis Morecroft of DNM whose company and products were wonderfully detailed in a recent Art Dudley column in Stereophile. The Resolution/DNM connection and associated Euro styling are an outgrowth of meetings between Jeff and his Swiss/German distributor Reson. Their lineup of DNM, Creek, Epos, Gallo, Goldring, Resolution and Rethm speaks volumes about a certain - er, reson, reason & sensibility? In fact, the Reson website very cleverly refers to Resolution's CDP/amp combo as bonsai audio. It is this bow to 47labs-reminiscent minimalism which leaves its imprimatur on the styling and size of the Opus 21 and thus makes a deliberate turnabout from the grotesque he-man values that dominate so much of present US-based HighEnd audio. 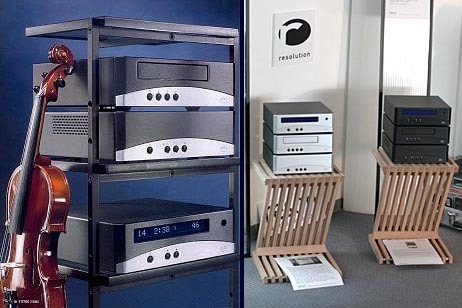 Like John Stronczer of Bel Canto and Kevin Halverson of Muse Audio, Jeffrey Kalt of Resolution is one of America's premier digital designers and was involved in the audio consortium that helped define certain aspects of 24/96 DVD Audio. 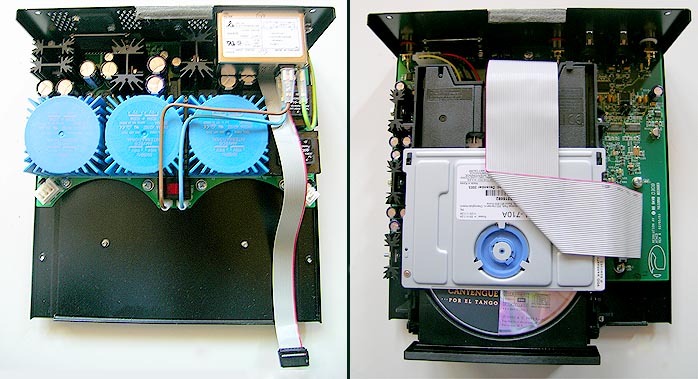 The Opus 21 is his statement on affordable peak performance RedBook playback, with the absence of SACD or DVD-A functionality perhaps an implicit statement that optimized CD performance at $3,500 cannot mean universal excellence. Jeffrey doesn't believe in asynchronous upsampling and the four BurrBrown PCM 1704 24-bit ladder-type DACs are thus extrapolated x 16 to 705kHz @ 24-bit word length. Like its predecessors, the Opus 21 is ready for amp-direct connection. Unlike the digital-domain attenuation championed by Wadia, Resolution Audio points at the data loss intrinsic to that approach especially when used outside a narrow window. This Silicon Valley firm has thus always incorporated analog-domain volume control. 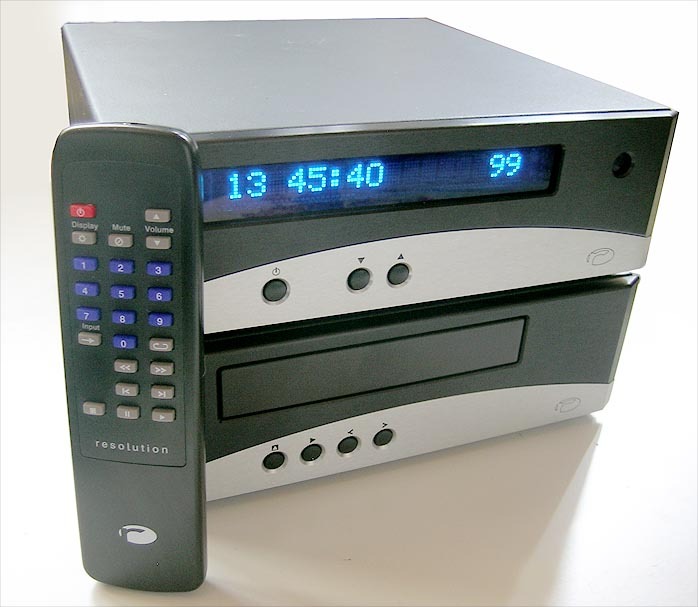 The Opus 21 offers single-ended and balanced outputs as well as a digital input that can accept up to 96kHz data to turn the Opus 21 into an outboard DVD decoder [be sure to set your DVD player to PCM output as this player won't decode AC-3 or DTS multi-channel]. A special 5-pin DIN output socket interfaces with particular DNM preamplifiers. 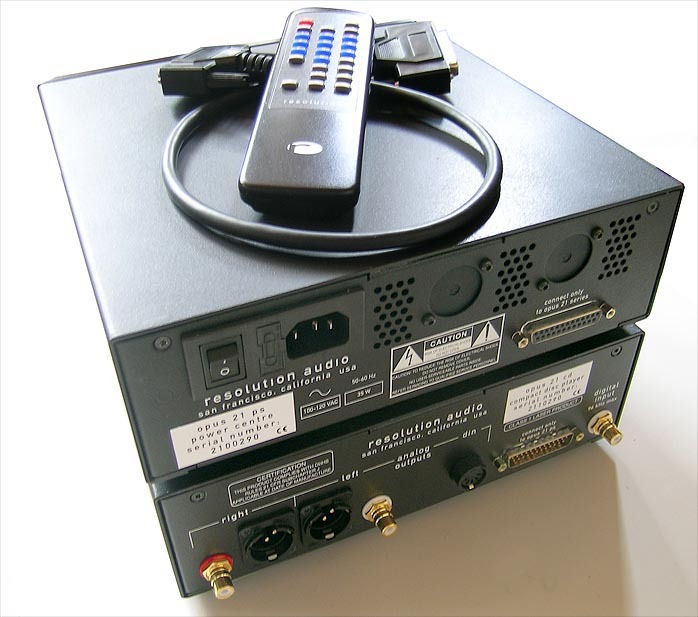 If used with any preamplifier regardless of make, the remote-accessible setup menu can automatically set the variable outputs to zero attenuation i.e. 99 max. Attenuation steps are 0.5dB from -30dB to full signal and 1dB from -31 to -69dB. Maximum output voltage at 2.5/5Vrms single-ended/balanced is slightly higher than industry standard. Output impedance is 100 ohms. The most unusual aspect of the Opus 21 is the segregation of circuitry into two aluminum boxes which does not follow the usual custom of separating transport and DAC but isolates the power supply and display circuitry for better S/N performance. 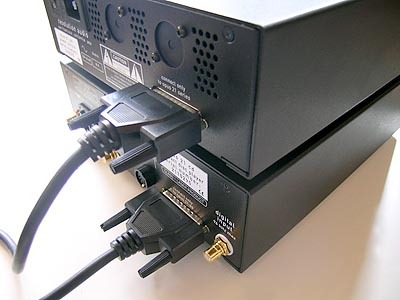 What connects both 9.5" x 9.8" x 3" WxDxH boxes with their combined weight of ca. 22 lbs is an included 2-ft long 25-pin computer serial cable. The light blue fluorescent display is unusually large and thus legible well across even a deep room. Three brightness levels and display off can be accessed from the plastic remote and any subsequent command in display sleep mode will wake up the readout. The remote provides basic functionality, eschews time remain modes and instead includes mute. Front panel controls are limited to open, play, back and forward on the player unit and power and volume up/down on the display/power-supply half.